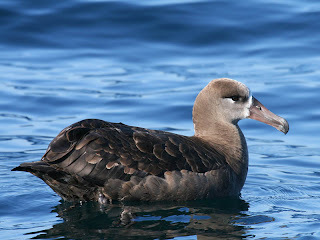 Welcome to The Bird Guide Inc.'s pelagic blog on Oregon and West Coast seabirds. I have been meaning to start this blog for some months, and now unemployment has given me some free time! The Bird Guide, Inc. started offering guided ocean birding boat trips off Oregon in 1994. This blog will take the place of the Oregon Seabirds mailing list I created to communicate with our regular pelagic trip participants. Planned topics include trip announcements and results, of course, but also West Coast seabird status and distribution articles. A note I received from recent trip guests Marti and Lew Ligocki requested more ID information. Of course, while we're on the boat, our guides attempt to teach ID of the birds we're seeing. The Ligocki's wished for more comparative plumage discussions in a class the night before the trip or on a CD. Good ideas, but I thought that a blog format could accomplish the same instruction but start right away and keep on giving! It's less initial work and there's no need for it ever to end! One other thing I wanted to add to this blog is finding certain target land birds on the central Oregon coast. Visitors are always asking about where to find Rock Sandpiper, Wandering Tattler, Harlequin Duck, Wrentit, Hermit Warbler, and other local birds from shore before and after the trip. Additionally, sometimes trips do weather-out. So having alternative land-based birding plans are always a wise precaution.